It is hard to determine the exact value of an endgame move, and often in a real game, there is no time for that either. 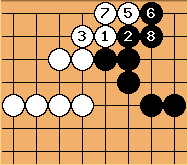 Therefore here's a page about how to quickly make an estimation of an end game move. Note the values mentioned here are deiri values. How many points is the second line hane worth here? It is easy to read out something like this for Black. And something like this for White. Instead of trying to count the territory in both reading and make out the difference,there's a simpler way to know the difference. When we say a move at is someone's privilege, it basically just means it will be a sente move at some point. Such move should be played after it becomes sente, but before the reverse sente gets played. The idea is simple, but mistakes about wrong timing happen all the time. a is 1 points sente for White, but when should White play it? First calculate the threat size. 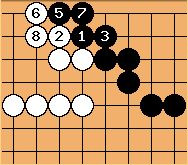 Left: Black doesn't answer and White gets 4 points. 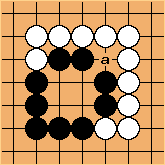 Right: Black answers and has 3 points. So the threat size is 7. Next calculate the value of reverse sente. The difference is 1 point. 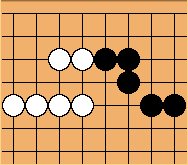 Therefore, the answer is: White should play this move when the ambient temperature is between 2 points and 7 points. Ideally, White would like to play this when the ambient temperature is as close to 1 point as possible -- that's what it means to be a 1 point sente --, but that's another story.